The Hubble constant — the rate at which the Universe is expanding — is one of the fundamental quantities describing our Universe. 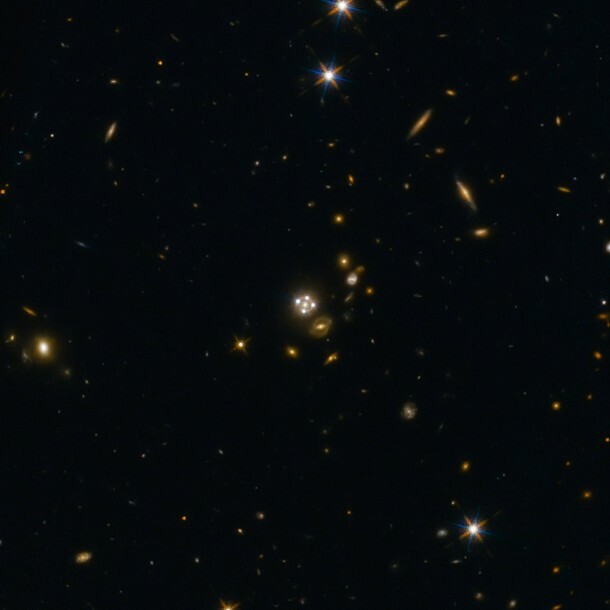 A group of astronomers from the H0LiCOW collaboration, led by Sherry Suyu, Max Planck professor at the Technical University Munich (TUM) and the Max Planck Institute for Astrophysics in Garching, Germany, used the NASA/ESA Hubble Space Telescope and other telescopes in space and on the ground to observe five galaxies in order to arrive at an independent measurement of the Hubble constant. This research was presented in a series of papers to appear in the Monthly Notices of the Royal Astronomical Society. Because galaxies do not create perfectly spherical distortions in the fabric of space and the lensing galaxies and quasars are not perfectly aligned, the light from the different images of the background quasar follows paths which have slightly different lengths. Since the brightness of quasars changes over time, astronomers can see the different images flicker at different times, the delays between them depending on the lengths of the paths the light has taken. These delays are directly related to the value of the Hubble constant. “Our method is the most simple and direct way to measure the Hubble constant as it only uses geometry and General Relativity, no other assumptions,” explains co-lead Frédéric Courbin from the Laboratory of Astrophysics, Lastro (EPFL), Switzerland.